In March of this year, UK supermarket giant Tesco introduced meat alternative dishes created by Nordic food sensation Oumph, to much success. 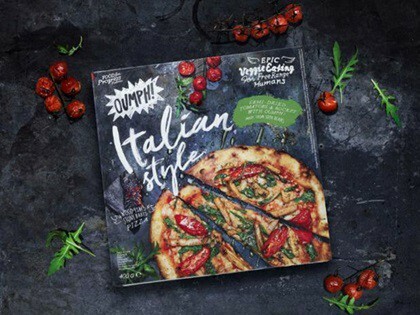 Now Oumph hope to expand their presence in the UK by launching a vegan pizza, which will be available in Tesco from the 16th September. The Italian style pizza is topped with rocket, soy meat, garlic, and Violife cheese. Retailing at £3.99, it will roll out across 179 Tesco stores, and will be stored in the frozen aisle alongside another new Oumph product; a bacon alternative called Oumph Salty and Smoky. When Oumph was launched in February in Scandanavia, the pre-hype was such that stores sold out within days across Iceland and Sweden, due to “overwhelming demand.” Tesco’s Wicked Healthy vegan brand by chef Derek Sarno has also been selling out across the UK, so it is expected that the expansion will be a continuation of this success.